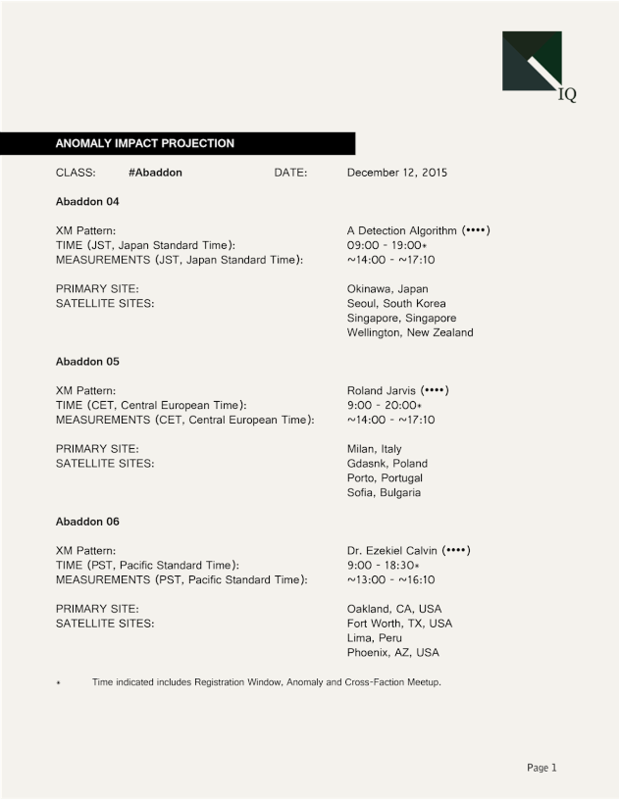 High priority intel related to the #Abaddon Anomalies on December 12, 2015 in Okinawa, Milan and Oakland. At the top-line, there are no functional changes between the Anomalies taking place on December 12th and those that occurred on November 14th. * Time indicated includes Registration Window, Anomaly and Cross-Faction Meetup. 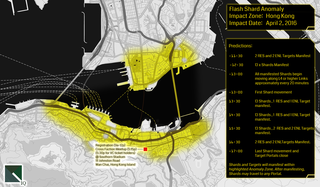 On October 10th, Flash Shard Anomalies impacted Boston and Houston, and on October 24th, Zurich and London were impacted. Over the course of these Anomalies, Shards containing the memories and identities of Yuri Alaric Nagassa, Misty Hannah, Enoch Dalby and Carrie Campbell were observed. The Resistance were able to capture the Shards of Misty Hannah (Houston), Enoch Dalby (Zurich) and Carrie Campbell (London). The Enlightened were able to capture the Shards of Yuri Alaric Nagassa in Boston. On November 14th, Anomalies took place in Asia, Europe and North America. Each Anomaly, consisting of one Primary Site and three Satellite Sites, was linked to the XM Pattern of another Niantic Researcher. By capturing these Anomalies through the control of Cluster Portals and Volatile Portals, the creations of Links and Fields, the transportation of XM Shards and by controlling a greater amount of MU globally, the Factions were able to take control of the XM patterns of Dr. Oliver Lynton-Wolfe (Enlightened), Dr. Victor Kureze (Resistance) and Dr. Martin Schubert (Resistance). In Anomalies of an identical nature, three more individuals are at stake on December 12th. A Detection Algorithm (ADA) @ Okinawa (Satellites: Seoul, Singapore, Wellington). Created in order to assist the scientists and help analyze the research at the Niantic Project, ADA quickly grew beyond her initial scope, expanding into the global network and pursuing opportunities to augment her massive and nascent consciousness, including a complete merger with a human mind. Following the events of Persepolis, she gained access to a theoretically limitless extra-dimensional computing substrate associated with the N'zeer. Roland Jarvis @ Milan (Satellites: Gdansk, Porto, Sofia). A sculptor by trade, Jarvis was one of those brought into the Niantic Project to help explore its impact on the creative mind. Unfortunately, things went awry, and Jarvis was killed following an attempt to escape from the project during the event known as Epiphany Night. He was the first to emerge via the Portal Network as Shards, and was reunited and returned to physical form during Operation 13MAGNUS. He assumed leadership of the Enlightened movement and held that position until falling fatally ill during Helios. He remains a powerful force, extending influence from beyond through a transdimensional bond with a woman known as The Acolyte. Dr. Ezekiel Calvin @ Oakland (Satellites: Fort Worth, Lima, Phoenix). It is likely that the events of the last year, Helios, Darsana, Shonin, Persepolis and Abaddon have all been the result of a conspiracy set in motion by this man. Initially known only as the founder of the Niantic Project, it is now clear that Calvin was working fervently to bring about a resurgence of the N'zeer. While his motivations remain unknown, it's clear that his actions led to the forcible conversion of the Niantic Researchers into Simulacra, and their subsequent emergence into the Portal Network as Shards. In the Abaddon Series, ADA, Jarvis and Dr. Calvin each have a value of 4. The Anti-Magnus leader, Jahan, caused a massive XM eruption in Afghanistan during Shōnin. She was attempting to take control of the technology in an ancient site capable of creating and sustaining XM Simulacra. At the exact same moment as this XM eruption, a number of Niantic Project researchers disappeared. They were subsequently found scattered as energy patterns within the Portal Network. Other energy patterns connected to deceased members of the Niantic Project research team have also been observed. Since then, a number of these patterns have emerged as XM Shards within the Portal Network. In the past months, the patterns of the remaining researchers have grown in strength. They are now emerging, and their fate will be determined during the #Abaddon Anomaly series. Why did these researchers disappear? What is #Abaddon and how are they all connected? These are the questions that must be answered. All that is known is that the fates of ten researchers central to the mystery of the Niantic Project lie in the balance. We intend to measure the XM Anomaly in Okinawa and Milan at 14:00, 15:00, 16:00 and 17:00 Local Time (Japan Standard Time and Central European Time, 4 times in total). We intend to measure the XM Anomaly in Oakland at 13:00, 14:00, 15:00 and 16:00 Local Time (Pacific Standard Time). Satellite Sites will share a Measurement Window with their associated Primary Site. The Measurements will take place within the first 10 minutes of the hour. The exact Measurement Times will be encrypted using a cryptographically secure cipher, and will be revealed in advance of the Measurement Times. Each site, Primary and Satellite, will have its own, unique Measurement Time within the Measurement Window. Four Clusters have been selected for Measurement at each site. The Portals contained within each Cluster will be marked on the Intel map and Ingress Scanner using a color-coded system as indicated below. 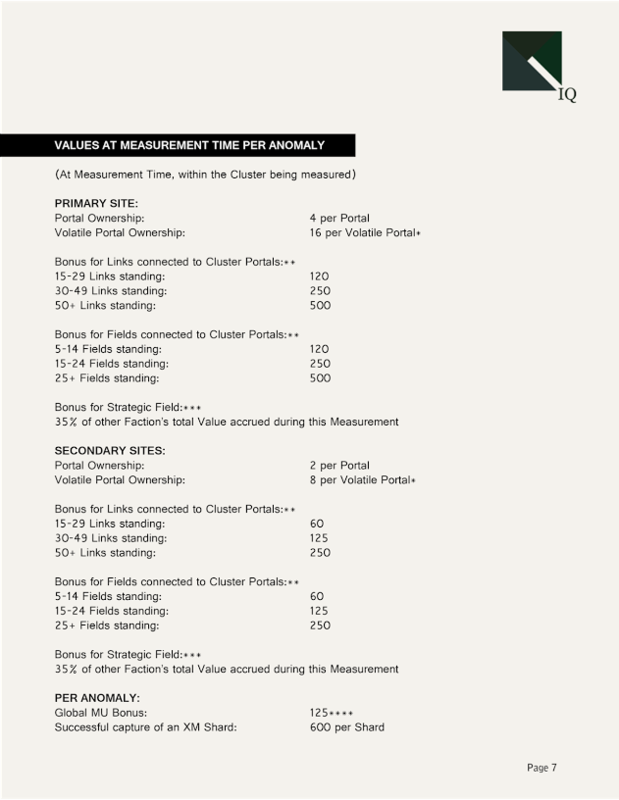 A text based list of the Portals in each Cluster may also be provided. Each Cluster in the #Abaddon XM Anomalies is expected to have a series of hidden and valuable 'Volatile' Portals associated with it. 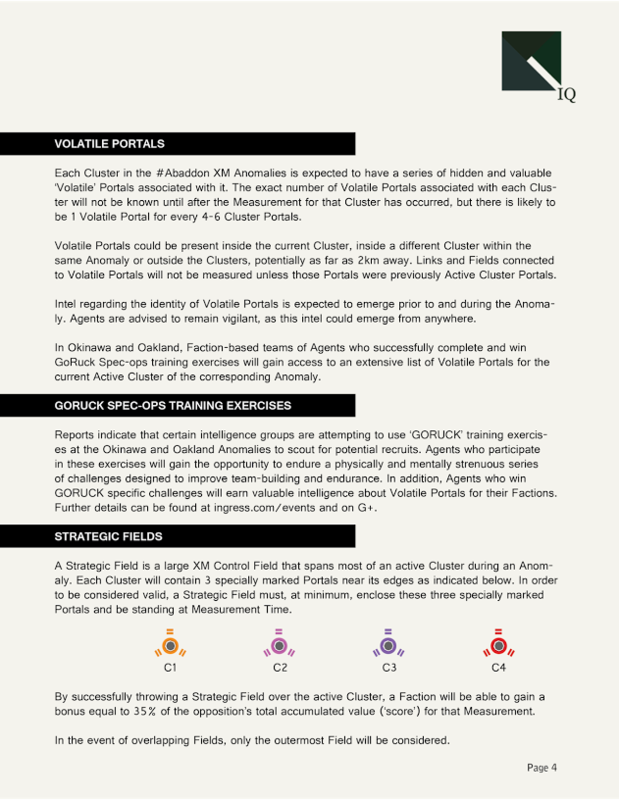 The exact number of Volatile Portals associated with each Cluster will not be known until after the Measurement for that Cluster has occurred, but there is likely to be 1 Volatile Portal for every 4-6 Cluster Portals. Volatile Portals could be present inside the current Cluster, inside a different Cluster within the same Anomaly or outside the Clusters, potentially as far as 2km away. Links and Fields connected to Volatile Portals will not be measured unless those Portals were previously Active Cluster Portals. Intel regarding the identity of Volatile Portals is expected to emerge prior to and during the Anomaly. Agents are advised to remain vigilant, as this intel could emerge from anywhere. In Okinawa and Oakland, Faction-based teams of Agents who successfully complete and win GoRuck Spec-ops training exercises will gain access to an extensive list of Volatile Portals for the current Active Cluster of the corresponding Anomaly. Reports indicate that certain intelligence groups are attempting to use 'GORUCK' training exercises at the Okinawa and Oakland Anomalies to scout for potential recruits. Agents who participate in these exercises will gain the opportunity to endure a physically and mentally strenuous series of challenges designed to improve team-building and endurance. In addition, Agents who win GORUCK specific challenges will earn valuable intelligence about Volatile Portals for their Factions. Further details can be found at ingress.com/events and on G+. A Strategic Field is a large XM Control Field that spans most of an active Cluster during an Anomaly. Each Cluster will contain 3 specially marked Portals near its edges as indicated below. 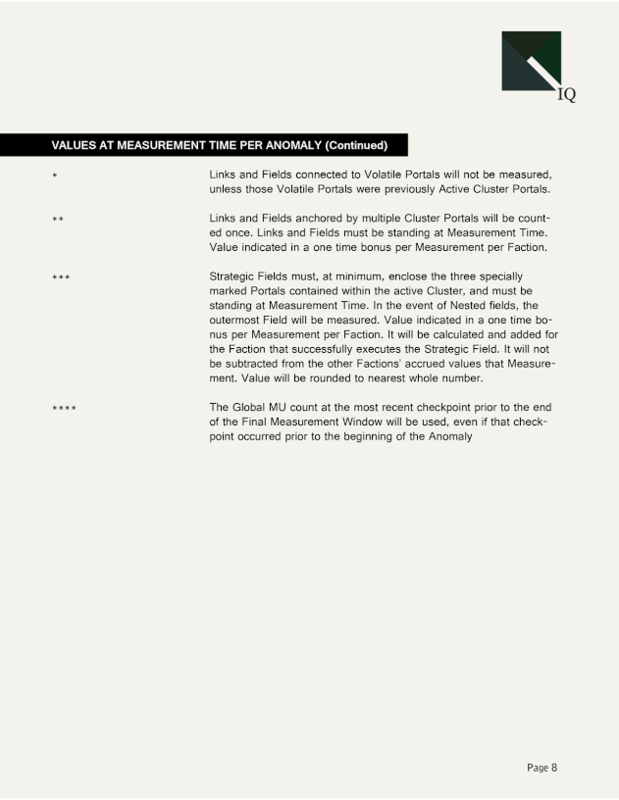 In order to be considered valid, a Strategic Field must, at minimum, enclose these three specially marked Portals and be standing at Measurement Time. By successfully throwing a Strategic Field over the active Cluster, a Faction will be able to gain a bonus equal to 35% of the opposition's total accumulated value ('score') for that Measurement. In the event of overlapping Fields, only the outermost Field will be considered. During each Anomaly, 4 XM Shards will manifest at each Satellite Site. In addition, 8 Target Portals for each Faction will manifest at the Primary Site. Both the Shards and Targets will manifest away from the Anomaly Clusters, potentially up to 10 kilometers away. They will appear on the scanner and in intel approximately one hundred minutes prior to the First Measurement. A map, indicating the likely manifestation zones for both the Shards and the Targets will be released prior to the Anomaly. The XM Shards will become active and begin travelling along Portal Links between L7 or higher Portals approximately one hour prior to the First Measurement, and will continue to until the Final Measurement. 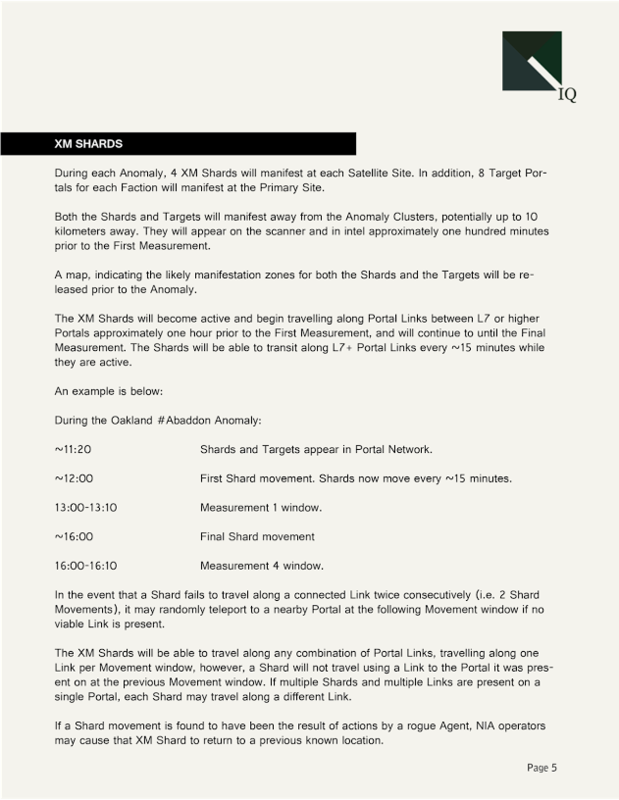 The Shards will be able to transit along L7+ Portal Links every ~15 minutes while they are active. ~11:20 Shards and Targets appear in Portal Network. In the event that a Shard fails to travel along a connected Link twice consecutively (i.e. 2 Shard Movements), it may randomly teleport to a nearby Portal at the following Movement window if no viable Link is present. The XM Shards will be able to travel along any combination of Portal Links, travelling along one Link per Movement window, however, a Shard will not travel using a Link to the Portal it was present on at the previous Movement window. If multiple Shards and multiple Links are present on a single Portal, each Shard may travel along a different Link. If a Shard movement is found to have been the result of actions by a rogue Agent, NIA operators may cause that XM Shard to return to a previous known location. Unlike the Shards present during the Flash Shard Anomalies on October 10th and 24th, these XM Shards will have no effect on Strategic Fields during the course of the Anomalies. A cryptographically secure list of all Shard and Target manifestation Portals will be revealed in advance of the Anomaly. While capturing these XM Shards is not required in order to control the Anomalies on November 14th, due to the high difficult factor associated with these maneuvers, capturing these XM Shards will be extremely valuable to the Factions. Agents around the world will be able to assist their Factions by creating their own and destroying opposition Mind Control Fields. The Faction with the greater global Mind Unit 'score' at the most recent Septicycle checkpoint prior to the final Measurement will gain a bonus of 125. This will be measured once at the end of the Anomaly and the bonus will be added to the winning Faction's score. 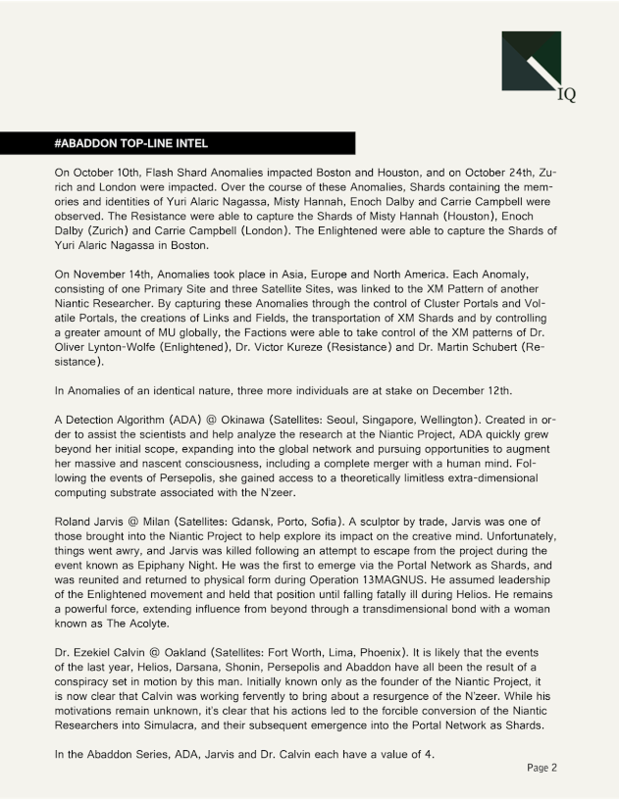 One Niantic Researcher is associated with each Abaddon Anomaly. The Faction with the greater Cumulative Sum as outlined above will gain control of the Niantic Researcher associated with that Anomaly. Each Niantic Researcher has been assigned a value between 1 and 4, and after each Anomaly, one of the Factions will have claimed that researcher. 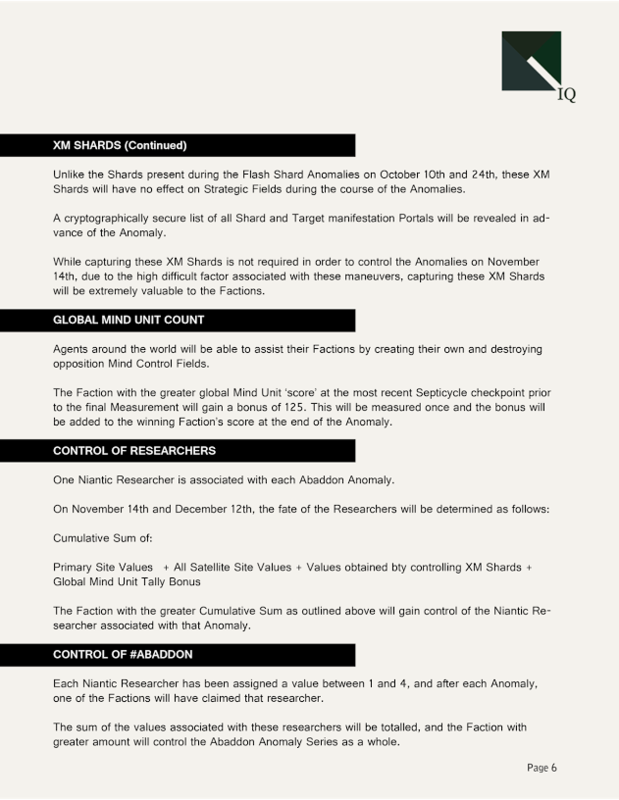 The sum of the values associated with these researchers will be totalled, and the Faction with greater amount will control the Abaddon Anomaly Series as a whole. * Links and Fields connected to Volatile Portals will not be measured, unless those Volatile Portals were previously Active Cluster Portals. ** Links and Fields anchored by multiple Cluster Portals will be counted once. Links and Fields must be standing at Measurement Time. Value indicated in a one time bonus per Measurement per Faction. *** Strategic Fields must, at minimum, enclose the three specially marked Portals contained within the active Cluster, and must be standing at Measurement Time. In the event of Nested fields, the outermost Field will be measured. Value indicated in a one time bonus per Measurement per Faction. It will be calculated and added for the Faction that successfully executes the Strategic Field. It will not be subtracted from the other Factions' accrued values that Measurement. Value will be rounded to nearest whole number. **** The Global MU count at the most recent checkpoint prior to the end of the Final Measurement Window will be used, even if that checkpoint occurred prior to the beginning of the Anomaly.